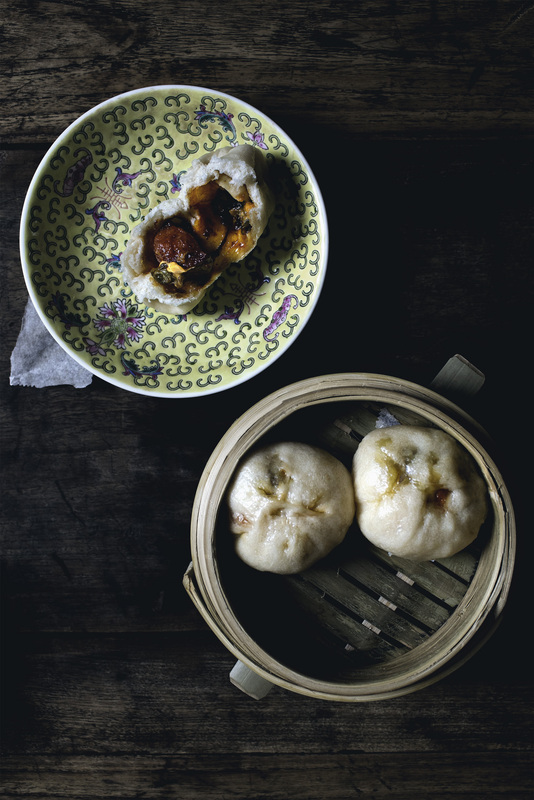 WHAT: Super cute and tiny steamed buns stuffed with braised pork belly, pan-fried capers and smooth peanut butter. WHY: It’s pork bun in baby form! It’s pork bun in two-bites size! It’s pork bun but pop-able! Dispute settled. HOW: The idea is to create an over-the-top, porky, fatty and gooey bun-tasy with a built-in acidic element to balance it all out, and this is what came out on the other side. 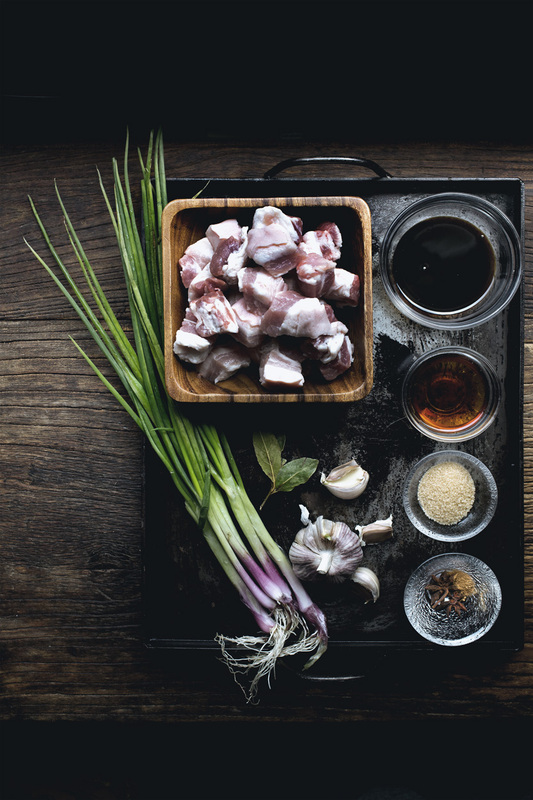 Inspired by traditional Taiwanese guabao (which is the former life of David Chang’s infamous “pork bun”), the pork belly is first braised with aromatics and spices until melty and tender, but instead of ground peanuts that’s used in guabao, smooth peanut butter is being introduced. 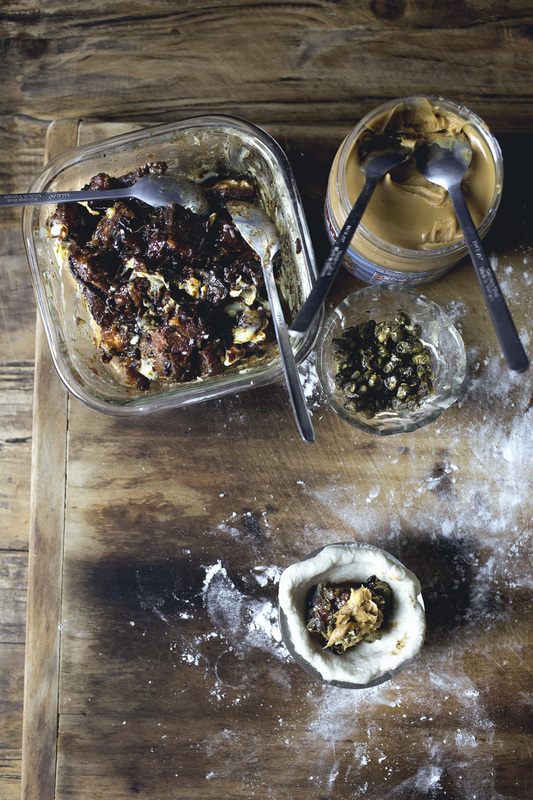 Just when pork belly and peanut butter – both fatty, gooey and intense – are locking tongues in your mouth, the taste buds get a sharp and pleasant zing of acidity and pickle-ness from pan-fried capers, all swirling and dancing inside this slightly sweet and chewy dough. What’s more wrong? Eating just one or more? I can’t decide. 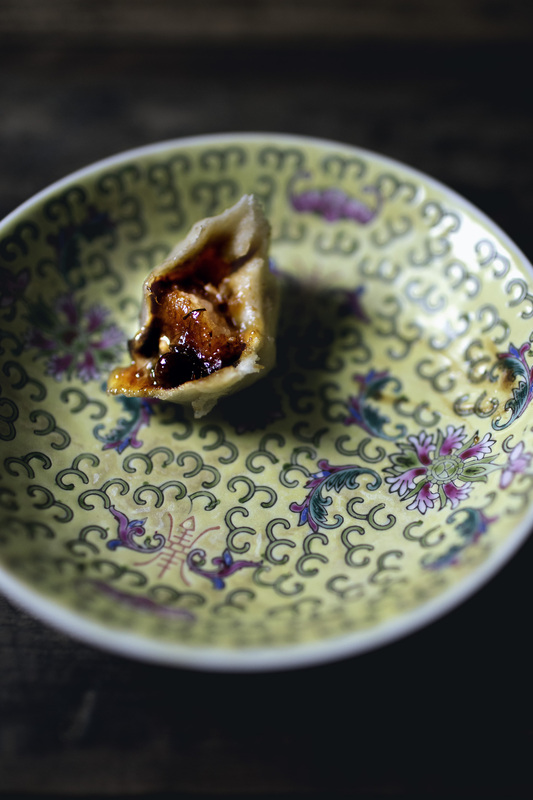 By the way, most of the recipes in DIM SUM MONTH is designed to be prepared ahead of time. Make each items and store them in the freezer, and at the end of the month, we’re going to have a dim sum blowout party. See ya! 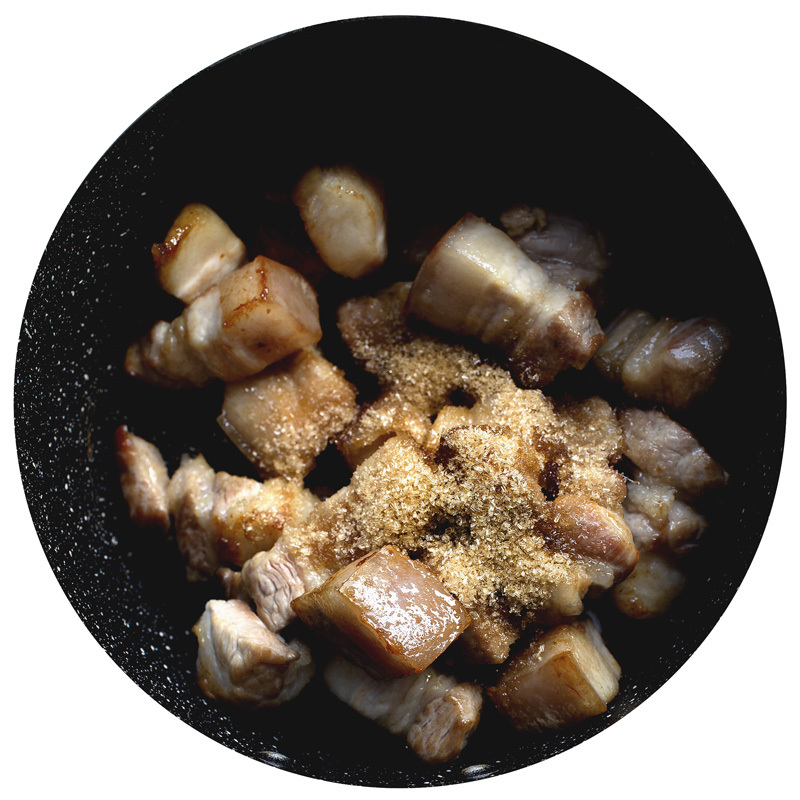 PREPARE PORK BELLY: Cut the pork belly into 1" (2.5 cm) dices, set aside. In an oven-proof pot, heat vegetable oil and cook the scallions until browned all over and shriveled, then remove with a slotted spoon and set aside. 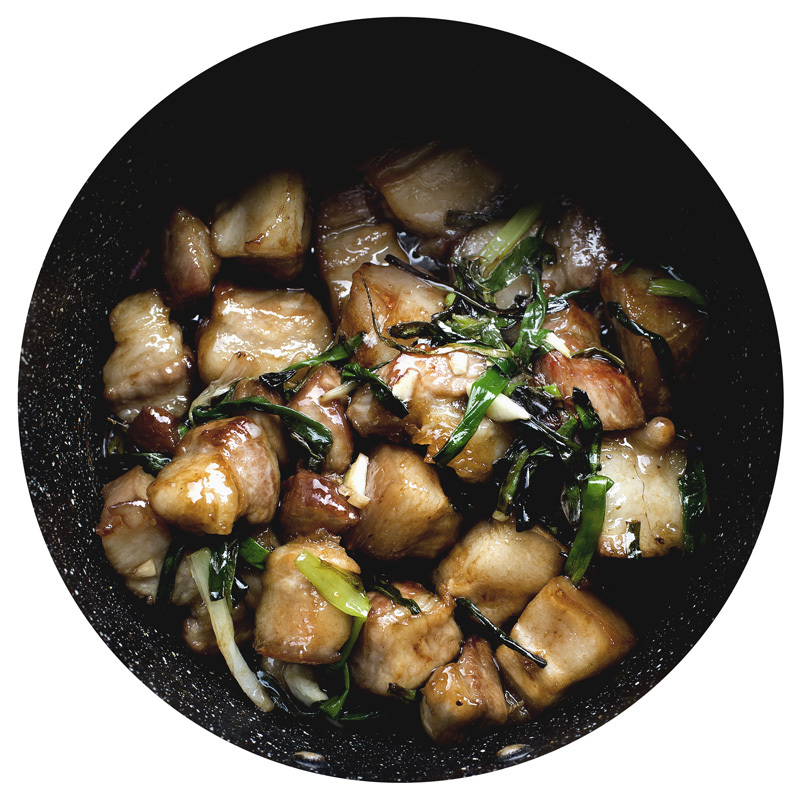 Add the diced pork belly and cook until the edges are slightly browned and some of the fat is being rendered out. Pour all the fat out of the pot, then add the light brown sugar. 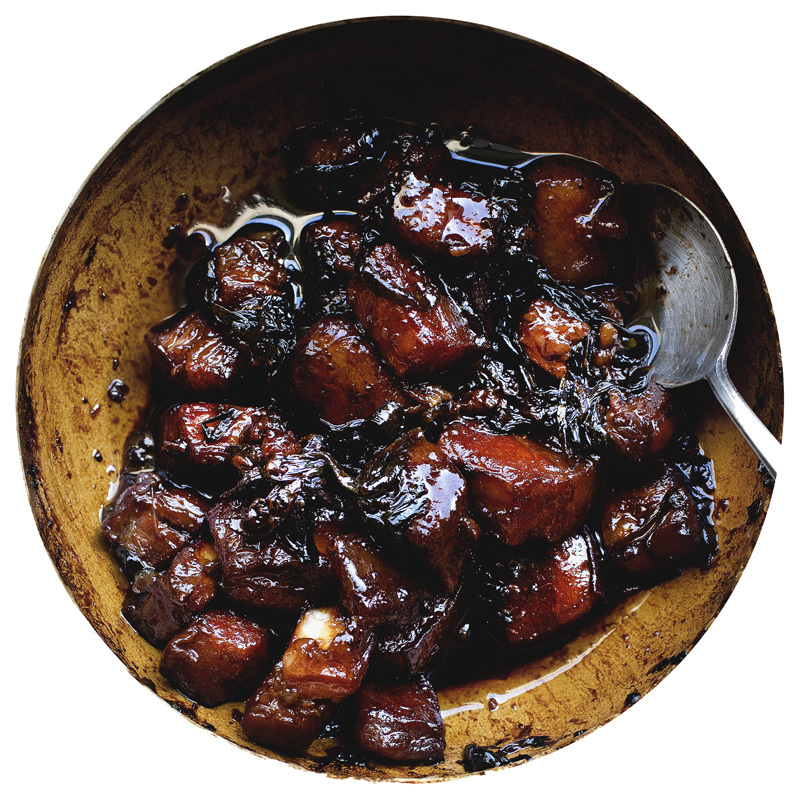 Continue to cook, stirring frequently, until the edges of the pork belly and the sugar are caramelized. Now add the scallions back in along with garlic. 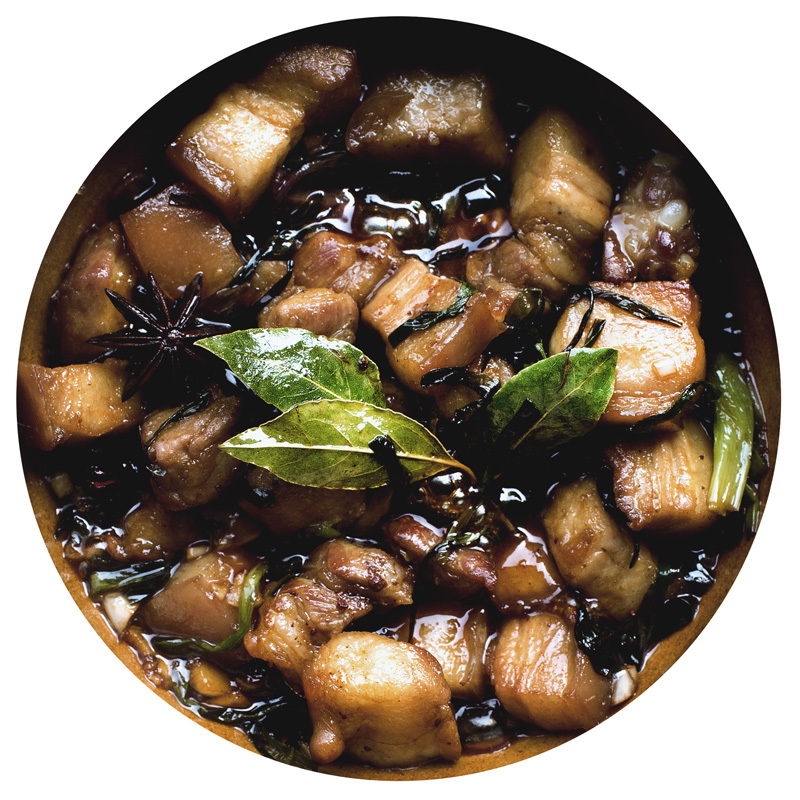 Cook for 1 min until fragrant, then add shaoxing wine, soy sauce, bay leaves, star anise and ground cinnamon. Bring to a simmer, put the lid on, then transfer into a 300 F/150 C oven. Give it a stir every 30 min, and cook for about 1:40 ~1:50 hour until it's melty tender (if it looks like there's no more liquid left at any point during cooking, just add a bit more shaoxing wine). Remove the bay leaves and star anise, and skim off most of the fat off of the surface. Then transfer into an air-tight container and chill until completely cold, at least 6 hours or overnight. PREPARE DOUGH: In a stand-mixer with dough-hook, combine bread flour, granulated sugar, instant dry yeast, salt and water. Knead on medium speed until incorporated, then turn to high speed and knead for 10 min until extremely smooth and elastic. The dough should pull away cleanly from the sides and bottom of the bowl during mixing, but should be soft and pliable. If it's sticking to the bowl during mixing, add more flour. If it feels stiff and dry, add a bit more water. Cover with plastic wrap and let rise in a warm place until fully doubled, about 2~4 hours depending. MAKE THE BUN: In a small skillet, combine drained capers, vegetable oil, sugar and rice vinegar. Cook on medium-high heat, stirring constantly, until the capers are slightly browned and shriveled. Set aside to cool completely. Transfer the dough to a lightly floured surface and fold it over itself a couple times, then divide into 17 equal portions. Tuck each portions under itself to shape into a tight ball, then let rest and relax for 10 min. 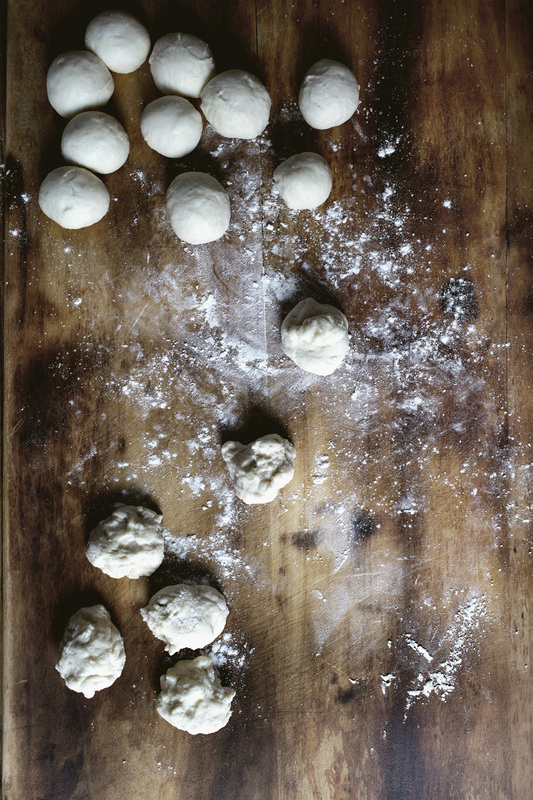 Take a small saucer about 2 1/2" in diameter, then place 1 dough ball inside. Use your fingers to press and spread the dough outwards until it drapes over the edges with a dent in the middle (the edges should be slightly thinner than the center). Place 1 piece of braised pork belly in the middle, 6~7 fried capers, and a little less than 1/2 tsp of smooth peanut butter. 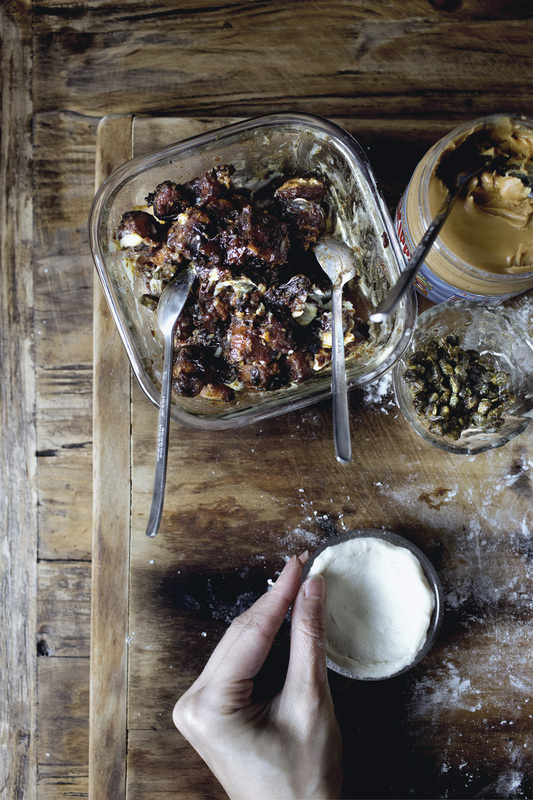 Bring the sides of the dough together and pinch to close tightly. Repeat with the rest. You can freeze the buns now until hard, then keep in an air-tight bag until needed. If you're freezing them, take them out 6 hours before serving. Place each on a small piece of parchment paper, cover with plastic-wrap, and let thaw and proof until almost doubled (about 80%). 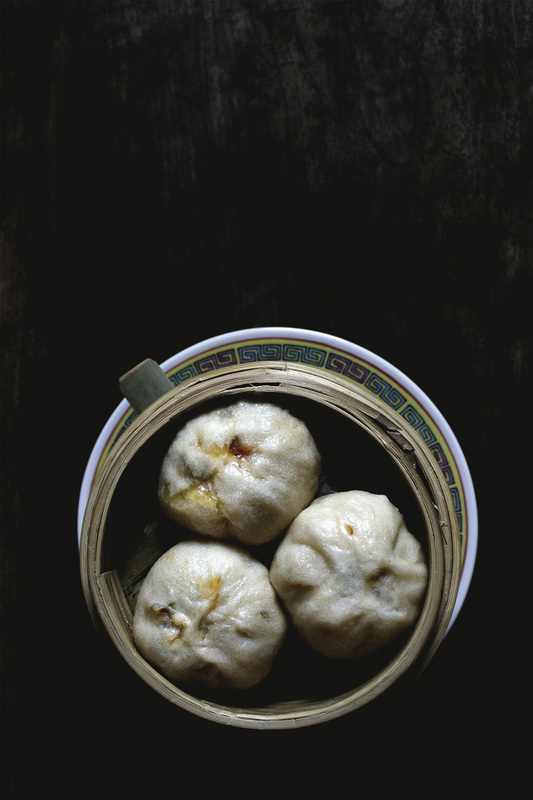 If your place is warm and the buns are rising too fast, simply place them in the fridge to slow down. If you are not freezing the buns, it will only take about 1~2 hours for the to almost double. Place in the steamer and steam on high heat for 7~8 min. Mandy, you are a mad scientist most genius in the kitchen…mind blown with this one. And, I want to eat it immediately. Loving your Dim sum-month so far! Getting all giddy each time you put out a new recipe. Are there any suitable replacements for the peanut butter if one is allergic? Khiem, oh boy, I’m not sure what can mimic peanut butter here. Perhaps other nut butter? But the flavor will be different of course. Tahini (ground sesame seed paste) is a nice substitute for peanut butter, especially for those with nut allergies. Sunflower seed butter is my favorite PB replacement. Has the smooth unctuousness of great peanut butter. So…why 17 and not 16 or 18? 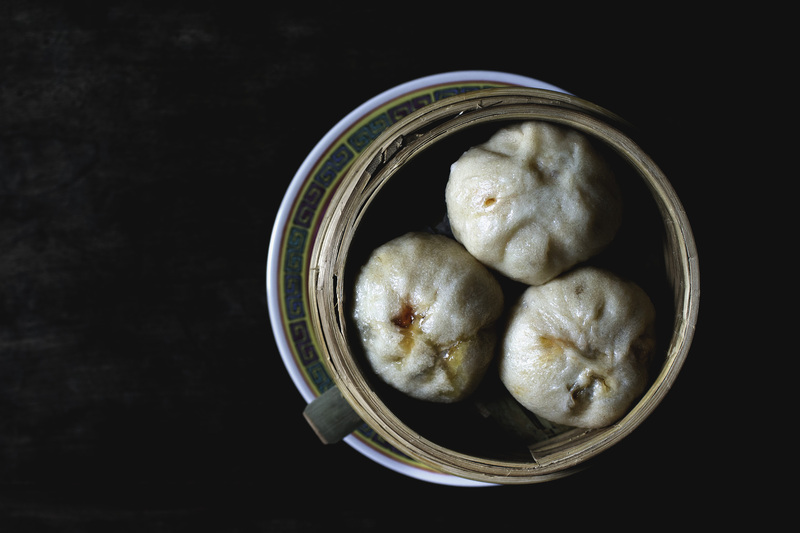 Can every month be dim sum month from now on? Each recipe knocks me over more than the last! DIM SOM MONTH SHOULD NEVER END!!!! So so so impressive as always, Mandy. Can’t wait to try this one with the fam!! Do you use regular peanut butter (like Jif etc.) or natural? Does it matter? Brian, I use Jif! I wouldn’t use natural because it breaks. This is such a fun and novel little series you’ve got going, Mandy!!!!! And I’m totally in love with these little buns. The way you describe them is just so romantic and delish ? I can see how those flavors work. one word – ingenious !!! This is mouth-watering and I don’t want to wait till I make it, I want to eat it right now! This was the best month ever. Thank you for all of this, Mandy!! Oh my gods. This recipe looks unbelievable and I can’t wait to try it out. And your photos – gorgeous! 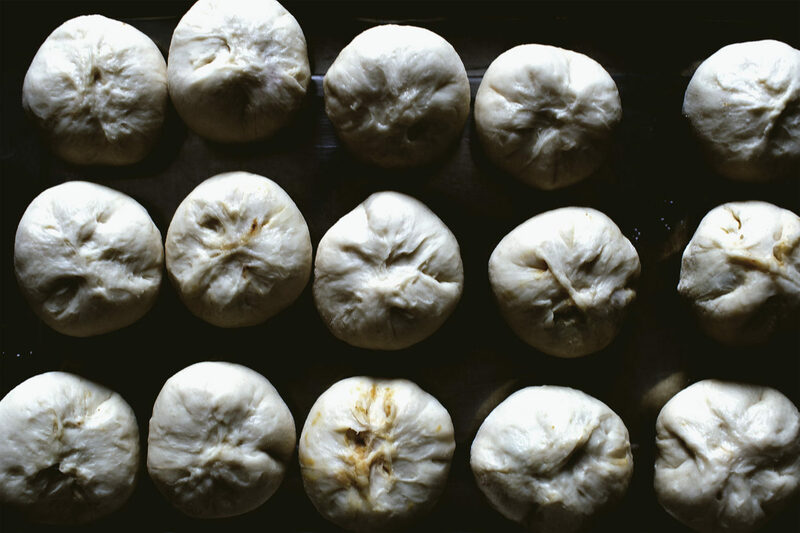 wow, by far the most innovative recipe of Bao i have seen! You need to open a restaurant or freeze them so i can buy them! i am so lazy to cook them but I really want to try them!!!! Just found the link to you making this exact dream food! How fortunate, I could really use the handholding.